So you’ve discovered the many issues with commercial pet food and have decided that a home cooked diet is much healthier for your dog. But do you know about the importance of properly balancing your dog’s home cooked meals? A plate of fresh vegetables, lean protein, and a smart starch may leave you feeling fueled, but there are different guidelines to follow when creating a complete meal for your pet. In other words, that bowl of chicken, spinach, and rice that you’re feeding your dog may actually be doing him more harm than good. Dogs need a nuanced combination of vitamins and minerals to be truly nourished, and it’s extremely difficult for pet owners to come up with balanced recipes or create appropriate meals on their own that are safe for long-term feeding. In an effort to examine this conundrum, a UC Davis study analyzed 200 recipes for dogs using sources like veterinary textbooks, pet care books, and websites. The study revealed that 95% of the recipes they examined lacked at least one vital nutrient for dogs, and 83% percent had multiple nutrient deficiencies. Even home cooked meals supplemented with a multivitamin won’t sufficiently satisfy your dog’s dietary requirements or replicate how certain key ingredients work together to meet your dog’s nutritional needs. Not convinced? Let’s take a closer look at the most common nutrient deficiencies that can result from an imbalanced homemade diet. Zinc has many essential functions in the body including protein synthesis, skin and wound healing, and stabilizing DNA/RNA structures and cell membranes. We told you it was essential. Although relatively non toxic, zinc can also interfere with the absorption of other minerals if consumed in large quantities, so as is the case with so much in life, balance is key. Choline plays a wide ranging role in your dog’s nutrition and can have a direct impact on liver function. This macronutrient is a structural part of cell membranes and lipoproteins, which are essential for lipid/fat transfer throughout the body. Over time, choline deficiencies can affect normal liver function and lead to the accumulation of fat in the liver. There are two important forms of vitamin D: vitamin D2 (mainly found in plants) and vitamin D3 (which is found in fatty meats and liver). The primary function of vitamin D is to enhance intestinal absorption of calcium and phosphorus and maintain control of calcium homeostasis within the body. Vitamin E is the major fat-soluble antioxidant present throughout the body and tissues and prevents oxidative damage to cell membranes and DNA/RNA structures. In other words, it’s pretty crucial. Research has shown that vitamin D deficiencies in dogs can lead to rickets and bone deformities, while vitamin E deficiencies manifest as degenerative muscle diseases associated with muscle weakness and reproductive failure. Don’t skimp on this duo. Copper is a trace mineral and is incorporated in a variety of proteins and enzymes which perform essential functions for your dog. These include the formation and maintenance of bone and connective tissue, the formation of red blood cells, and normal nerve fiber formation. Side effects of a copper deficiency include connective tissue disorders and loss of hair pigmentation. These babies are a mouthful, but their purpose can be summarized in two words: brain function. Long chain omega 3 fatty acids (typically found in cold water fish and algae) are important cell membrane components involved in cell signaling and are essential for normal function of the brain and retina. Calcium serves two major functions: it’s a structural component of bones and teeth and a cellular messenger involved in nerve impulse transmission. Low calcium levels in a dog’s blood — aka hypocalcemia — can become a serious condition resulting in spontaneous bone fractures and nerve damage. Diets containing mainly meat without additional calcium (hey chicken and rice, we’re looking at you) are a common cause of calcium deficiencies. 1. Consult with a board-certified veterinary nutritionist about nutritionally appropriate recipes that are safe for long term feeding. 2. Find a reputable company that can provide you with a specially formulated vitamin mix and recipe that, together, will create a safe and balanced diet. 3. Get balanced, home cooked meals made fresh for your dog and delivered to your door. 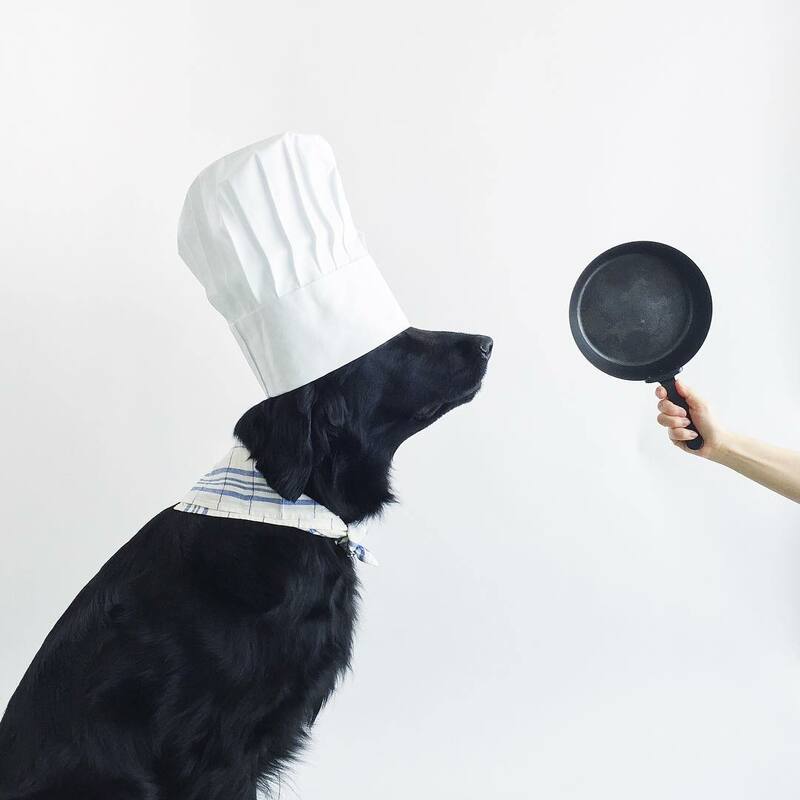 Know someone who manages to juggle life while being a chef for their dog? We’re sure their furry loved one is grateful! Just make sure they understand the importance of balancing that doggy diet, too. Looking forward to using your vitamin/mineral mix for home cooked food. I believe I’m on the list to be notified when it is available. Do you have an approximate date for availability? I appreciate your products and help to make nutritious meals for our dog at home. I am very impressed. Thank you! I am interested in the vitamin/mineral mix. Please let me know when it is available. Thanks. Need the vitamin mineral mix. I used to make his food but realized I didn’t know how to get him the vitamins be needed. Please let me know when available as I love cooking for him.